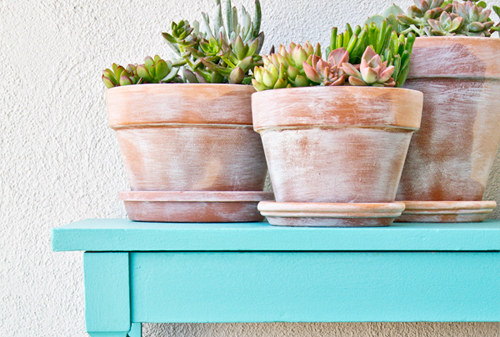 It only takes 3 items to make these adorable pots and you don�t even need to be crafty. 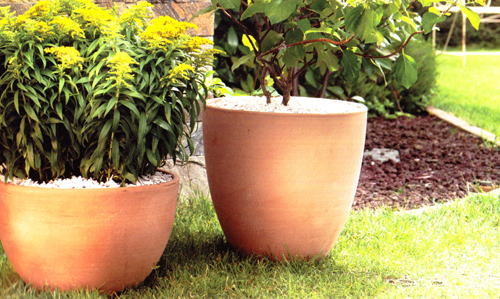 Find the size of garden pot that you want to start with. 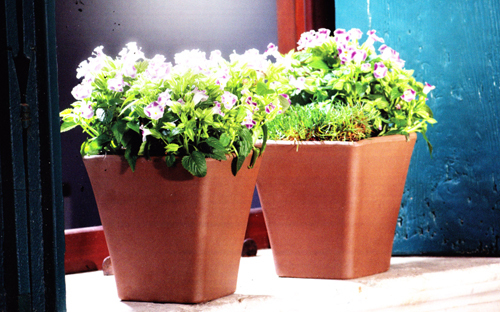 The pots shown are our Italian Terracotta Standard Flowerpots size CM11 but of course you can go larger or smaller depending on the outcome you are looking for. 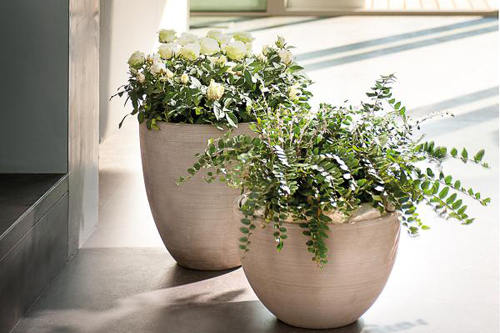 Our Italian pots are made with the highest standards and firing process, which create a smooth finish that is easy to paint on. Mark on the sides of the pots with pencil or painters tape where you would like the lines to be. Turn the pots upside down and start to paint in the different sections. It will take a couple of coats before you get a full color with no bleed. Try to make the pots look like candy corn so start with the yellow bottom, orange middle and white around the lip. Let dry completely. 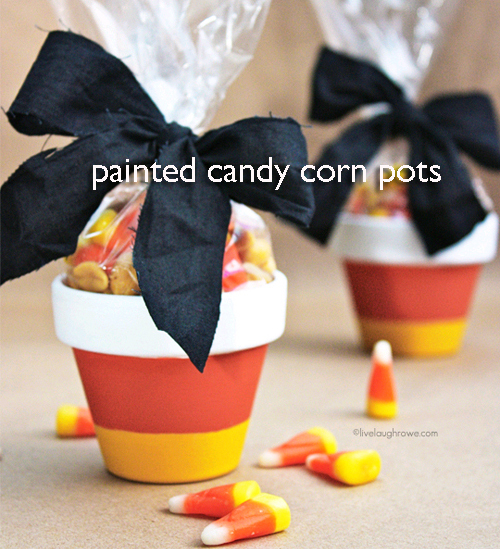 Take small plastic bags and fill with candy corn. Tie the top with twine and then put a black ribbon over it and make a bow. 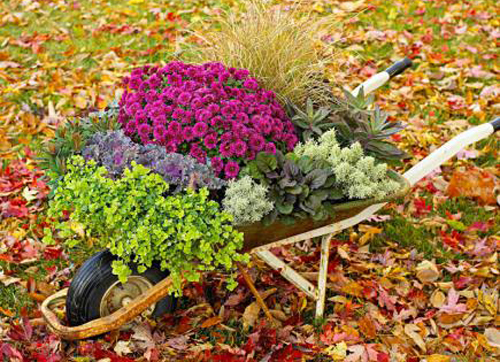 Read more..... 5 tips for overwintering containers. 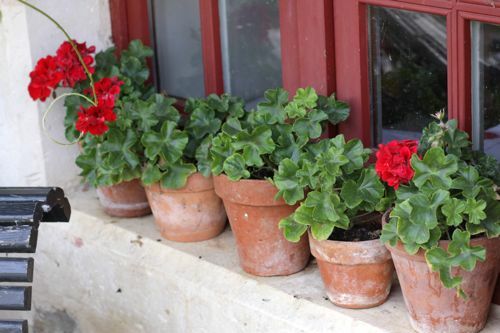 As we wrap up the planting season and head into winter, we wanted to share this great tip we saw on how to store potted geraniums for winter. 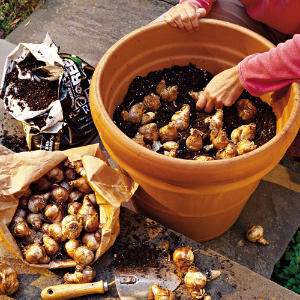 You can move them indoors and store them as potted houseplants if you have the room, or you can let them go dormant for a few months in storage and then repot them for spring. 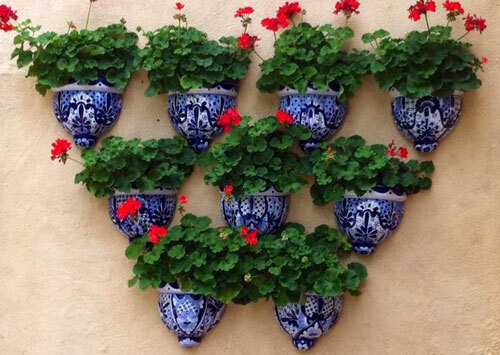 While storing potted plants for winter is only somewhat frugal you may want to hang onto them since the colors of potted geraniums vary from season to season. Below are a few suggestions you could use to help keep them till Spring. 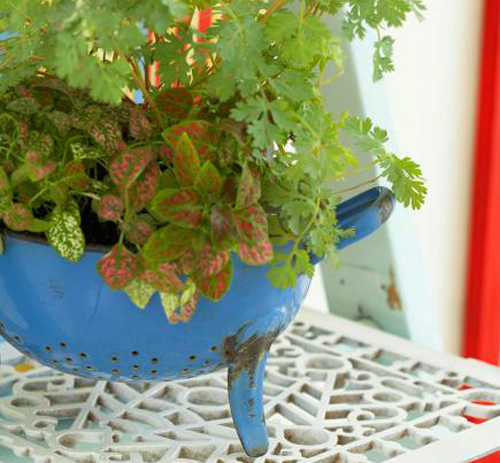 Dig up the geraniums, sort them by color if you want to keep track, gently shake off any loose soil from the roots and remove any dead leaves, flower heads or buds. Check for aphids, spider mites, fungal gnats, and other little insects. Clip off any mold or rotted areas. 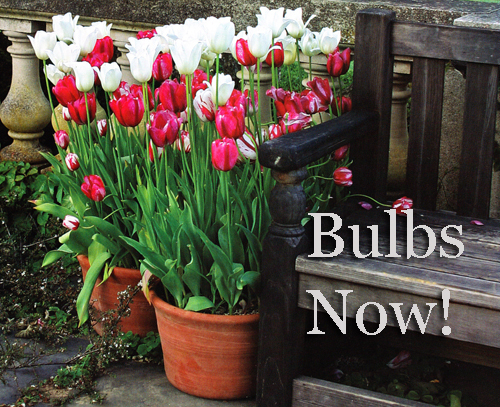 Now you can either repot the plants and keep them as houseplants or let them go dormant till you pot them up next Spring. Place the plant in a paper bag and label with the plant name and color of flowers. 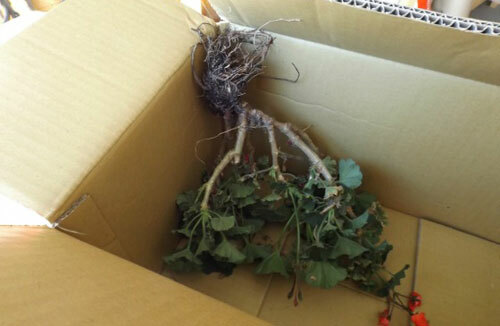 Place the plant upside down in the bag with the roots sticking out. Gently tie the bag shut with string. Hang the bag in the basement or garage. Check monthly for any signs of mold or rot. Remove those areas. 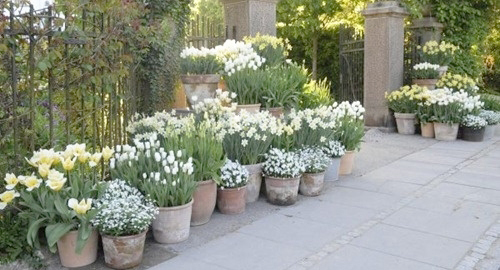 After a few months' time you can pot them in fresh container mix and a wonderful garden planter. 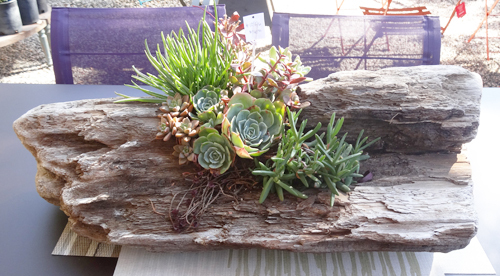 Read more.....Whats your garden style? 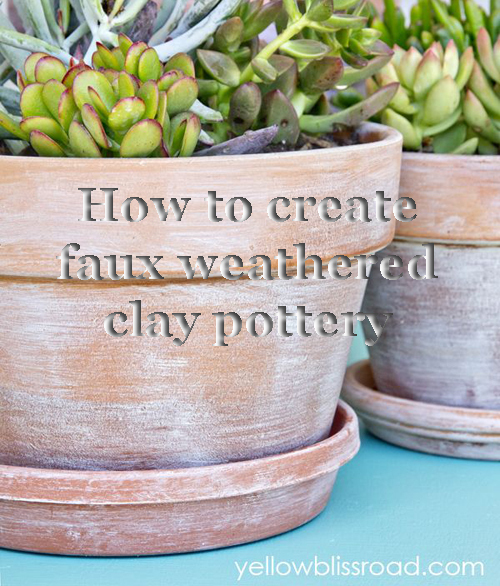 Have you ever wondered how super crafters can turn a plain terracotta clay pot into a weathered looking planter? Well, we found this on yellowblissroad.com and had to pass it along. 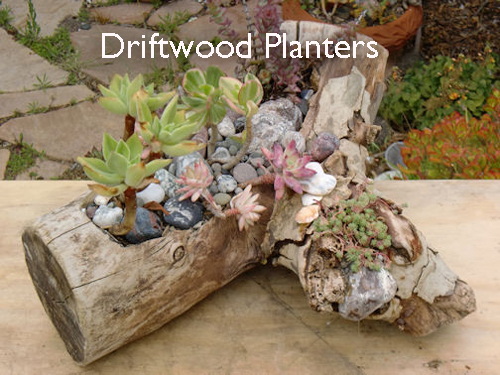 It looks like one of the easiest projects that you can do and the results are outstanding & beautiful. Tag along and we will share what we learned. First, dust the pots off and dry rag them to make sure no clay dust is present. Pour the primer on one paper place, and add a little wax. Mix well with a plastic spoon until smooth. Dip your brush lightly into the paint, just enough to barely cover the bristles, then swipe it several times onto the clean paper plate to remove excess. 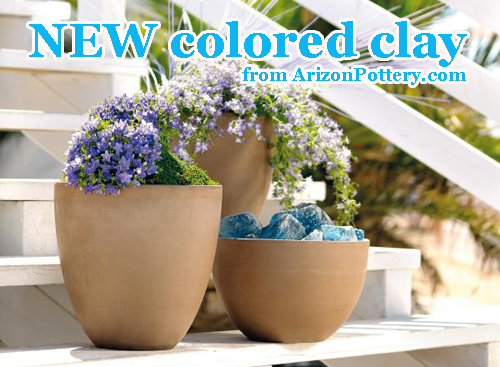 You are going for a dry brushed look and don't want to saturate the pot with paint. 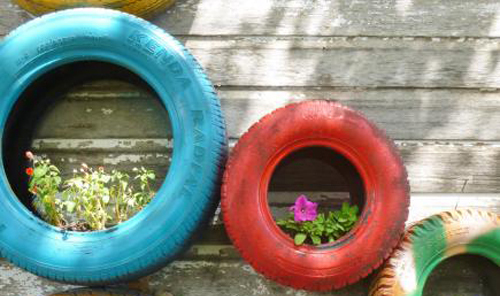 Brush paint all around your garden pot. Since you are using very little paint, the pots will dry quickly. 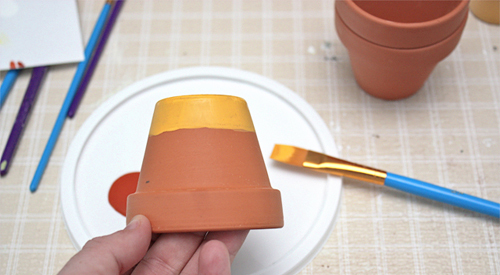 Take a sanding block and sand all around the pot in the direction of the paint. Use both heavy and light pressure to leave some spots with more paint than others and where the clay shows though. 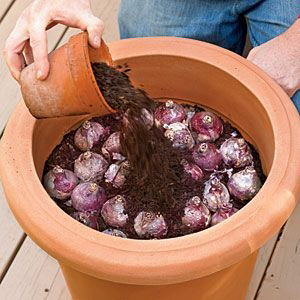 Read more.....Make a hobbit garden in a pot.